A NETS Victoria exhibition supported by the Victorian Government through Creative Victoria, from the SANDREW Collection. Callum Preston is a sucker for nostalgia. As a child of the Melbourne suburbs in the 1990s, Preston remembers his neighbourhood milk bar as a place of wonder: the buzzing neon, the faded posters of Diet Coke-loving windsurfers, collector cards, musk sticks, jelly snakes, cigarette ads, the ubiquitous smell of pies and the enticing crack of opening soft drink cans. Callum Preston’s MILK BAR will be on display at Swan Hill Regional Art Gallery in Victoria from Friday 29 March to Sunday 28 April 2019. For this exhibition Preston recreated his own childhood milk bar completely by hand, one chip packet and Coke can at a time. 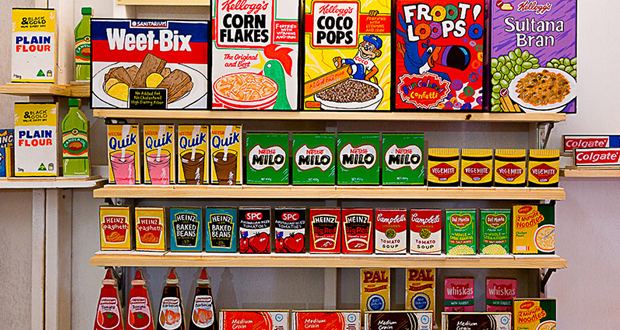 Like any milk bar, Preston’s is filled with the usual objects: magazines, chocolate bars and cereal boxes. He explores nostalgia and how commodification and shopping has changed. Callum Preston is a multi-faceted artist and designer from Melbourne, working across illustration, mural work, signwriting, sculpture, video and print. He has been a part of the Melbourne street art scene since 2002 and had his first solo exhibition in 2015. Melbourne-based street art collectors, Sandra Powell and Andrew King (SANDREW), discovered Preston’s MILK BAR on exhibit last year and, by acquiring it for their collection, have kept it together as a single work. An opening party will be held at 6pm on Friday, 29 March where Callum will speak about his work along with renowned art collector Sandra Powell of SANDREW.